With starting tackles Bryan Bulaga and David Bakhtiari out for the Green Bay Packers’ Thursday Night Game against the Chicago Bears, the team turned to a makeshift offensive line that consisted of guards, Lane Taylor, Jahri Evans and Lucas Patrick, tackle Justin McCray and center Corey Linsley. The job of protecting Aaron Rodgers’ blindside fell to fifth-year guard Lane Taylor. Prior to the contest, Taylor had played a total of 1766 snaps at guard, but never played a snap at tackle. 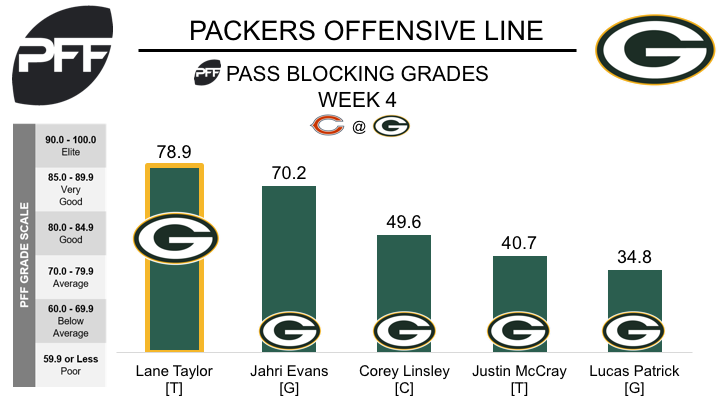 In a situation that could have easily been a disaster for the Packers passing attack, Taylor rose to the challenge and allowed just one hurry on his 29 pass blocking snaps. He ended the game with a pass blocking efficiency of 97.4 and a pass blocking grade of 78.9, both the best marks among Packers offensive linemen.